Hey there! My name is Michelle, and I stopped paying attention to how old I am but my fiancé tells me I’m 25. I live with him, my sister, and my best friend in an awesome house in Cincinnati, Ohio! Besides people friends who have to like me because we’re related or engaged or living together, I have three cat friends! Háma, Tibbers, and Purrl! They play the roles of IT / Security Guy, the Unpaid Intern, and my Secretary. There’s also Stitching Sabbatical’s Senior VP, Pip! We’re basically attached at the hip. 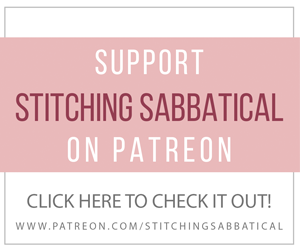 They all keep Stitching Sabbatical full of inspiration! I studied painting in college and I try to incorporate a lot of the techniques I learned into my embroidery. I really enjoy stitching as I find it’s a way to de-stress. Embroidery has helped push me out of my comfort zone little by little! I feel like I’ve come a long way with my depression and anxiety since I’ve started on this ‘sabbatical’. I’ve also met so many wonderful people who also enjoy this craft! 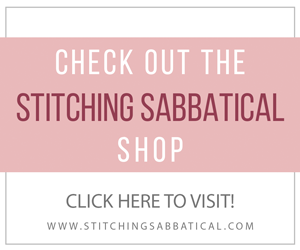 Stitching Sabbatical began in a tiny, unglamorous, studio apartment in Athens, Ohio. Feeling listless and uninspired during the summer months, I decided to take up a new hobby, cross stitching, as a way to pass time while my boyfriend (now fíance!) finished grad school. I quickly moved on to embroidery. I loved how free I was to make whatever I wanted on my fabric. My stitches didn’t have to be in uniform sizes or widths. I could do whatever I wanted with it. And I did. For me, Stitching Sabbatical has always been about comfort at home and showing loved ones that you care. I hope people feel a little more relaxed and at ease when viewing my work. I aim not to just stitch ‘a dog’ or ‘a cat’, but YOUR specific pet. I want their personalities to shine through each piece! I do a lot of work with people who have recently lost their pets and are looking for a way to remember them. It’s so touching to create a personalized piece of artwork to commemorate their pet. Helping someone through their grieving process (and potentially making their day a bit brighter!) really fills my heart. Every stitch is stitched with love, and I think that translates throughout my work. I hope each embroidery is like a little hug to every person who receives it. Currently, I’m thriving in a new city, surrounded by cute cats and lovely people. I couldn’t ask for more! Thank you for being a part of this journey with me! I can’t wait to see how far we’ll go. I’m always excited to share what I’ve been working on, and I’ve got a ton of new ideas that I can’t wait to share with you!